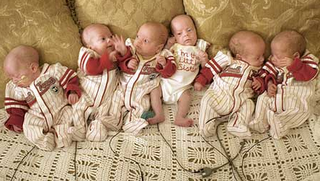 It has been 7 months since the Byler sextuplets made their grand entrance into the world weighing between 2 pounds, 5 ounces and 3 pounds. Boys Brady, Eli, Ryan, Jackson and Charlie and lone girl MacKenzie have all been home since December and out of the spotlight. Since then, three of them, Charlie, Jackson and Ryan, have been hospitalized a few days for pneumonia. Otherwise, all have been healthy, though Charlie and Jackson still require oxygen. Brady, the heaviest of the bunch, now weighs more than 16 pounds. MacKenzie, the smallest, weighs at least 12 pounds. Brady, Ryan and Eli have rolled over. “They’re all smiling and laughing, all teething and drooling,” Karoline said. Brady is called “Melon” because of his big head. Jackson, the “Drama Queen,” is still a mama’s boy. MacKenzie has a smile like the Joker in Batman. Two nurses work from 8 p.m. to 8 a.m. each day. All six babies and their older sister Zoe made a rare appearance out yesterday when they were baptized. In order to help out the baptizing Reverend, Ron Aubin and increase the cute factor, each Byler baby wore a white keepsake bib embroidered with the name and date. It is nice to hear that all of the babies are doing well. It is unfortunate that the site the family created for the babies has been taken down. We wish the family well!